your potatoes, carrots, and beets. You get to eat fresh food all winter. Canned, frozen, and dehydrated food is good, but fresh food tastes the best. 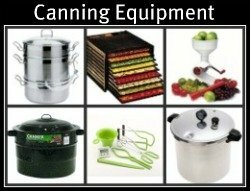 You don’t need to use any electricity or fuel to process and preserve your vegetables that go in the cellar. You save a bunch of time. Just dig up your potatoes, carrots, and beets, put them in the cellar, and you’re done. 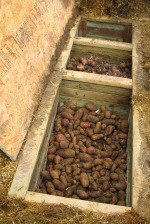 Root cellars are in the ground because root vegetables like potatoes, carrots, and beets need to stay Moist & Cool. Potatoes last all winter in the cellar. When the weather starts warming up, and the pit is not cool, the potatoes will start growing “eyes”. Cut your potatoes up and replant them. Each section that has an eye will become a new potato plant. Look at that! You’ll never have to buy new potato starts again. Just use your old sprouting potatoes. Great money saver!!! Make sure to save your best potatoes to replant. The new potatoes will be in the image of their mother potato. If you plant the small, leftover potatoes; you'll harvest small puny potatoes. When you dig up your carrots and put them in the cellar, put the larger carrots on the bottom. Use the smaller carrots first because they don’t last as long as the big carrots. Cut off all the green so that the carrots don't start sprouting. They last longer this way. 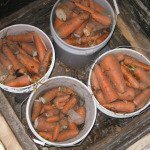 Another way to store your carrots is to leave them in the ground all winter. You can dig up your carrots whenever you need them. Storing carrots this way keeps them tasting really sweet. To keep the ground around your carrots from freezing, cover them with straw or leaves. To keep the rain and snow out, place a tarp on top of the straw and leaves. Use rocks or logs to hold your tarp down. Your carrots will stay fresh all winter. They’ll start to get mushy when the ground begins to thaw in the spring. If you have any left when the ground begins to thaw, dig them up and make carrot juice. Fresh carrot juice is a great source of nutrition, and it's yummy! We’ve tried root cellars and leaving them in the ground. Both methods work. I prefer the vegetable cellar because I don’t have to dig carrots in the middle of the winter. 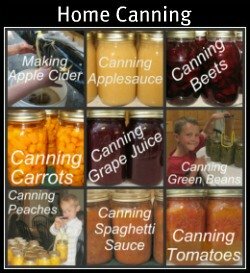 Canning carrots is another way to preserve your carrots. I can some and put some in the cellar – diversification! Also see growing carrots. 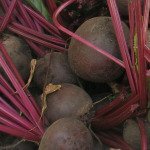 Beets will last until February or March in the cellar. When they start to go bad, they’ll get a little moldy and soft. They’re great while they last. Canning Beets is another way to preserve you beets. I can some and put some in the cellar. Use the fresh beets first. Also see Growing Beets. 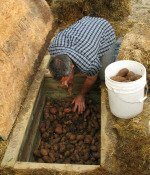 There are many types of root cellars. I’ll teach you how to build a simple cellar that works. We’ve built some that haven’t worked, but I don’t need to go into that story. 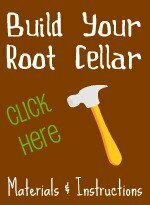 Click here to download plans for building this simple cellar. Rodents, snakes, and others small animals will sometimes get into your cellar. Your vegetables provide a great winter feast for them. We didn't have any trouble the first few years we had our root cellar, but one winter mice gnawed a hole in the wood and got into our potatoes. The next spring we lined our root cellar with hardware cloth. Hardware cloth comes in all sizes. We used the 1/4" x 1/4" size. This solved the rodent problem. 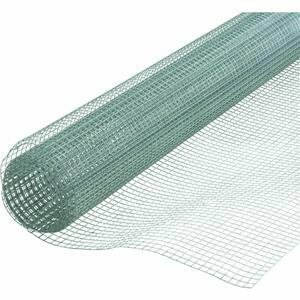 Hardware cloth is a flexible wire-mesh material. Here are a few different options for 1/4" x 1/4" Hardware Cloth. They come in different size rolls. Pick the option that best fits your building plan. You can also use use hardware cloth to put around your young fruit trees. The cloth keeps the small animals from eating the bark off the bottom of your tender trees during the winter. One winter we lost 60 fruit trees because of mice. The mice chewed a ring around the young trees at snow level. After a few years, the trees get a rougher bark. The mice don't seem to bother the older trees. You can remove the hardware cloth so the wood doesn't grow into the cloth. This hardware cloth comes in handy.